(Newser) – There's no better way to start off college than by proving yourself to be a "ticking time bomb"—or being forced to live with one. 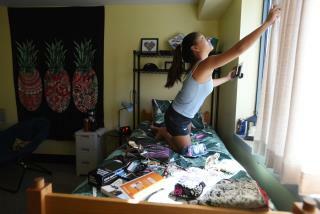 The latter is UCLA freshman Winnie Chen's predicament. Less than 48 hours after Chen and her two future roommates, Guistinna and Ashly, received each other's contact information at the start of the month, Ashly sent a rather insane email, which Chen posted to Twitter. Claiming her roommates had ignored previous emails, Ashly demanded a top bunk, one of two white closets, and a desk near the window of their dorm, per USA Today. This "is what I'm expecting once I arrive at the dorm and I won't be in the mood for any arguing or other nonsense," she wrote. "I'll turn it into a bigger situation so don't try me." Aw darn, she tweeted that the situation was resolved and there would be no more updates. However, for those of us who can't get enough of this kind of thing, try googling "Jessica Taylor" + "Penn State". Tell her you are taking her to IHOP as a peace offering. . Once there, parking lot education. Eat pancakes. Step over her. Get in car. rive back to dorm.